There is an organization called: S.E.T.I., “Search for Extraterrestrial Intelligence,” a group, located in Berkley California, who are dedicated to probing the Universe for signs of intelligent life. 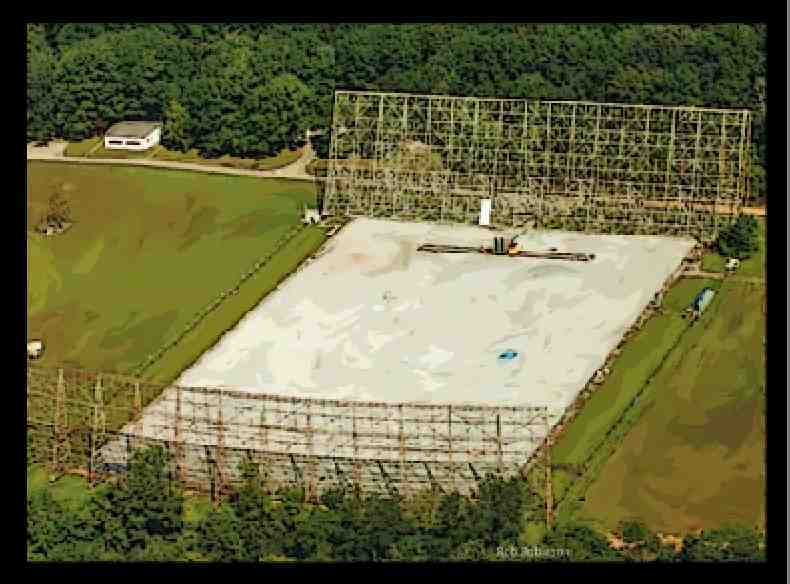 On the night of August 15, 1977, at the Ohio State University “Big Ear” Radio Telescope Observatory, Jerry Ehman was searching the skies for an alien signal. The observations he made on that night were recorded on a printout that has been preserved until today. Because the signal was detected by only one of Big Ear’s two beams and not by the other it was clear that it was not continuous. To the present day, S.E.T.I is trying to locate this transmission that is certain to have originated from an extra-terrestrial source. Based on the data, the origin of this radio wave came from an intelligence, billions of miles from earth. What if suddenly, live on a major news channel it was announced that S.E.T.I. had received another deep space communication of unknown origin. 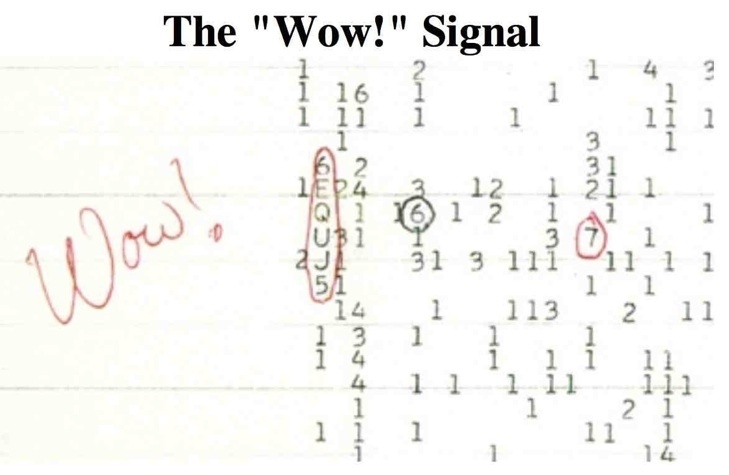 The printout indicated that the signal was from a source which claimed to be the Creator. The one who had created the Cosmos had sent a communication directed at earth and stated that He would be arriving on a specific date and location. What would be the reaction of people from earth? Through the prophet Daniel, a communication was made that originated from outside earth. Notice was given that an arrival was scheduled for the Creator of all things. He would come to Jerusalem, not with a great entourage of dignitaries and spectacle—but in humility, on the foal of a donkey. In Israel, whenever a great King was about to arrive in Jerusalem the people would line the street and lay palm branches along the road. As the king arrived at the entrance to the city, the people would wave their palm branches in the air. John records that during the feast of Passover, the people had gathered in preparation for just such an arrival. Those who believed that Jesus was the Messiah had heard that He was coming into Jerusalem. In response, they gathered along the street that led into the city and held palm branches in their hands. This is the day that we know as Palm Sunday. It was the time when Jesus chose to announce himself as the Messiah, at Jerusalem—in fulfillment of many Old Testament Prophecies (Prophecy 309, Prophecy 312, Prophecy 333, and Prophecy 338). How did the people know that Jesus was the King of Israel? Why did He pick this day to announce His arrival? On every other occasion when Jesus was encouraged by His disciples to tell the world who He was, Jesus consistently said, My time has not yet come. John 7:3-6 His brothers therefore said to Him, “Depart from here and go into Judea, that Your disciples also may see the works that You are doing. For no one does anything in secret while he himself seeks to be known openly. If You do these things, show Yourself to the world.”Then Jesus said to them, “My time has not yet come. Jesus was following a pre determined plan that was formulated before the earth was created. This was the day that the prophecies of the Old Testament had predicted that the Messiah would arrive and offer salvation to Israel and the whole world (See Prophecy 21 and Prophecy 66). All Jewish men were required to go up to Jerusalem for three of these feasts that were observed each year. Jesus rode into Jerusalem during the week long occasion of Passover. The streets of Jerusalem were crowded with as many as one million people in anticipation of this event. This was the time chosen by God when He would provide the world with the empirical evidence it requested. The Son of God would come to earth in the person of the Messiah, and fulfill all of His promises to bring redemption. For three years, Jesus did not allow Himself to be proclaimed as the Messiah until the precise moment required by the Old Testament prophecies. Psalm 118 (Prophecy 149), speaks of one specific day in the history of the world when this event would take place. To do so would be absolutely appropriate, but, this was not the reason that David wrote Psalm 118:24. This verse of prophetic scripture was written for one particular day in all of time and Eternity. It was written for the day that the Messiah would come to Jerusalem. No other day in the history of the world was to be proclaimed: This is the Day that the Lord has made. Only when the Messiah arrived at Jerusalem, would Psalm 118:24 be shouted. The People that were declaring; This is the Day that the Lord has made, knew well what they were saying. They believed that Jesus was the One that David wrote this prophecy for and they believed that He was their promised Messiah. (Prophecy 148) Psalms 118:22-26 The stone which the builders rejected Has become the chief cornerstone. This was the LORD’S doing; It is marvelous in our eyes. This is the day the LORD has made; We will rejoice and be glad in it. Save now, I pray, O LORD; O LORD, I pray, send now prosperity. Blessed is he who comes in the name of the LORD! We have blessed you from the house of the LORD. Not only does Psalm 118 declare the coming of the Messiah, but it also predicts that the Messiah will be rejected. Jesus is many times referred to as The Stone, or The Rock. Here, The Stone that the builders rejected has become the Chief Cornerstone. See Prophecy 191 for more information about the events of Psalm 118:22-23 that took place during the cutting of the stones for the first Temple. In ancient history the cornerstone was the joining of two walls, tying them together. It was the visible corner of the foundation of a building and the starting point for all future building on that foundation. This single stone was the most costly because of its beauty and strength. It was also the largest, and most solid and carefully constructed stone. To cast aside the cornerstone would remove the possibility of any future building on that foundation. The Cornerstone was the place where the building was joined together and the place where it rested. There is a group called “The Temple Mount Faithful” who every year attempt to bring the cornerstone of the Temple, to the Temple Mount at Jerusalem. Their Goal is to take back the Temple Mount and commence building the third Temple, in preparation for the Messiah. The Bible reveals that the third temple will be built (Location A) at the beginning of the seven year peace treaty, instituted by a new world ruler, called; the antichrist, or the beast. 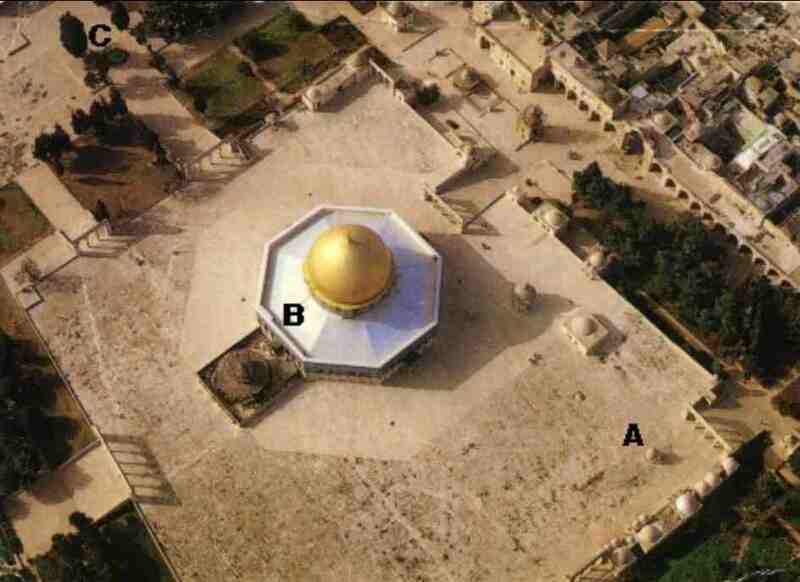 Today the temple mount has at it center, the Dome of the Rock, an islamic place of worship (Location B). When the first Temple was constructed, it was built by a remarkable set of circumstances. The traditions of the Elders of Israel, describe an extraordinary event. It seems that as the stones for the first Temple were being cut, they were numbered and shipped to the site where the Temple would be assembled. The Cornerstone inadvertently arrived at the temple mount without a number being assigned to it. The workers at the Temple site didn’t know where this strangely cut stone was supposed to be placed. It had an unusual shape, so the workers assumed that it was sent to the construction site by mistake. The builders cast the foundation stone over the side of the temple mount retaining wall and let it roll into the weeds below. Later on, when it was time to install the Chief Cornerstone in its place, this important stone could not be found. Realizing that the stone that the builders had rejected was in fact the Chief Cornerstone, they remembered that they had cast this precious stone aside. The builders went down into the weeds and brought the Cornerstone back to the temple site, and placed it where it belonged. Psalm 118 describes the Chief Cornerstone as the Messiah, who will be rejected when He comes, just as the builders of the first temple, rejected the cornerstone because they did not recognize its identity. When Jesus came to the “builders,” the leaders of Israel, they did not recognize their Chief Cornerstone, a repeated error of the first builders who assembled the temple of Solomon. David wrote Psalm 118, for this specific event that he described prophetically; when his son Solomon would carry out his instructions that he has left for him, to build the temple of God at Jerusalem. The specific language of Psalm 118, describing the rejection of the Cornerstone, was fulfilled at the building of the first temple by Solomon, and later, at the arrival of Jesus at Jerusalem—when He was rejected by the leaders of Israel, in fulfillment of the word of Psalm 118. By the words of David’s prophecy of the Messiah in Psalm 118, he predicted that the leaders of Israel would believe that Jesus claim to be the Messiah was a mistake. They would reject Him and cast Him aside—only to discover later, when He returns to earth the second time, that they had rejected their Chief Cornerstone. (Prophecy 354) Zechariah 12:10 And I will pour on the house of David and on the inhabitants of Jerusalem the Spirit of grace and supplication; then they will look on Me whom they pierced. Yes, they will mourn for Him as one mourns for his only son, and grieve for Him as one grieves for a firstborn. This prophecy will be fulfilled during the middle of the 7-year Tribulation, when Israel realizes that the one whom they pierced, two thousand years before, was the Messiah they had waited for. It is interesting that in the Hebrew alphabet, letters also have a numeric value attached to them. If we take the name “Lord Jesus Christ,” the total numeric value of all the letters contained in these 3 names adds up to 792. The total diameter of the Earth is 7,920 miles. How is it that the total numeric value of Jesus’ title in Hebrew adds up to the first three numerals of the earth’s diameter? Is this just a coincidence? Or does the number of Jesus’ name and the diameter of the earth match by design? Is this a hint from the maker of the earth that Jesus is the Chief Cornerstone of all the Earth? When the New Jerusalem—that great Cubed City—descends out of Heaven and settles just over the earth, as described in the Book of Revelation, the dimensions of that city are said to be 1,500 miles per side. When we convert 1,500 Miles into feet, you get 7,920,000 feet per side. Jesus is the Chief Cornerstone of the earth. He is the One who created all these things, and He is the One who holds all things together. Colossians 1:16-17 For by Jesus all things were created that are in heaven and that are on earth, visible and invisible, whether thrones or dominions or principalities or powers. All things were created through Him and for Him. And He is before all things, and in Him all things consist. Did Jesus build into the dimensions of the earth, a clue that He is the Chief Cornerstone of the world? How did the people know that this was the day that Psalm 118 was speaking of? Most of the people who were in Jerusalem at that time, did not notice Jesus and paid little attention to His arrival. The only way that a person could possibly know when the Messiah would arrive was by the predictive prophecies of the Old Testament. Daniel Chapter 9 is the first place where we notice that the Lord had promised a Messiah on a very specific date in history. In fact, if we carefully study this ninth chapter, we will see that the Lord told us the precise day the Savior would come. Background: How Daniel’s prophecy came from God. The Lord called a man by the name Abraham out of the city of Ur to go to a place in which the Lord would show him later. As a result of Abraham’s belief in what God had said, certain promises were made to him. The Lord told Abraham that He would make him a great nation, and that all of the people of the world would be blessed because he trusted the Lord. See Prophecy 5. God gave Abraham and his wife Sarah a son when they were both nearly 100 years old. This son of the Lord’s promise was called Isaac, and Isaac was given a son that he called Jacob. God prospered Abraham’s descendants, just as He said that He would. From Jacob, came the 12 tribes of Israel; and from the tribe of Judah, God promised that the Messiah would one day come. See Prophecy 6. During a great global famine, the 12 sons of Jacob went to Egypt to purchase grain for their family. His descendants ended up staying in Egypt for 400 years. At first, the sons of Jacob had great favor among the Pharaoh of Egypt; but many years after, a new Pharaoh came to power—who did not know Jacob’s family. Jacob’s once small kindred had grown to about two million descendants and were viewed by the new Pharaoh as a threat, should they decide to mount a rebellion against him. Fearing the descendants of Jacob, Pharaoh put them into slavery, building the famous cities of Egypt. When Moses came to lead Israel out of Egypt, they witnessed the most amazing miracles the world has ever seen. The Red Sea opened up to allow Jacob’s two million descendants to walk through unharmed; while the Egyptian army, who was coming to destroy Israel from the rear, was destroyed by God. For forty years, the Lord fed and watered over two million people, clothed them, and provided every need they had. See Prophecy 332. Finally brought into their own land, the people of Israel begin to prosper; and as they prospered, they slowly begin to forget the Lord and His law. The Lord had instructed Israel that for every six years in which they planted their fields with crops, they were to let the land rest during the seventh year. For 490 years, the people did not let the land rest one year in seven. They built up a land rest debt of 70 years. In response to their disobedience and the fact that they had forgotten the Lord who had brought them into this land, the Lord allows the king of Babylon to seize the people of Judah and take many of them captive. Carrying the best and the brightest to Nebuchadnezzar’s court, the king of Babylon kept these captives of Judah for seventy years. In this way, the land rested the seventy years that was owed to the Lord. When the captives of Israel were first taken to Babylon, a teenager by the name of Daniel, being just 17, grew in great favor before the king. Near the end of the 70 years of captivity, Daniel—now an old man—begins to read the prophecies of Jeremiah which predict the captivity of 70 years and their subsequent release at the end of the 70 years, which God had required. Realizing that their time of punishment from God was nearly over, Daniel begins to pray and seek the Lord. He repents for the sins of his people and their nation, and asks God to restore favor to Israel once again. The Lord will make provision for all of Israel’s constant rebellions against the Lord. He will send them a Savior—a Messiah—who will be the Savior of the whole world. This Savior will be rejected by Israel and the world, and be killed. During the entire process of these 490 years, all prophecy will be completed; and the end of this present world will come. This Savior will arrive at the end of 483 of the 490 years that are determined for Israel. The final 7 years will come during the last days of earth, when the antichrist will make his entrance into the world and announce that he is god. The signal that this 490-year countdown has begun will be determined by a “command” that will be given for the inhabitants of Judah to leave Babylon and return to restore and rebuild Jerusalem. On March 14th, the year 445 B.C., King Artaxerxes Longimanus of the Persians, gave this command. Counting from March 14th, 445 B.C. and adding 483 years, we come to the date in history: April 6th, the year 32 A.D. This corresponds to the Jewish calendar date of April 10, 32 A.D. This was the day that the people who had studied the word of God and knew of the prophecies of the Old Testament we have today, understood that the Messiah was about to make His arrival. The events of this day, April 6th, 32 A.D., are recorded for us in the gospel of Matthew Chapter 21. See Prophecy 309 for a detailed study of these events described in the prophecies of Daniel Chapter 9. Jesus arrived in Jerusalem as the Messiah on Palm Sunday, Nissan 10 on the Jewish Calendar—the day that the Lamb should be inspected before He is offered four days later as a sacrifice, on the 14th day of the month: Passover. Six hundred years before Jesus rode into Jerusalem—on this date, Zechariah wrote this prophecy in Zechariah 9:9. The individual parts of this prophecy are discussed in Prophecy 333, Prophecy 334, Prophecy 335, Prophecy 336, Prophecy 337, and Prophecy 338. After 39 years of studying these prophecies individually, I came to the realization that when they are read and studied together, the entire plan and purpose of God for the world is revealed in a new and exciting way. Many Biblical Scholars have estimated that there may be as many as 456 prophecies that Jesus fulfilled. I took the most important of these, in writing “365 Prophecies.” By placing all of these prophecies together in one book and linking them with each other while providing background and application for each prophecy, we see that there is only one person who can rightly be given the title Messiah, the Chief Cornerstone—Jesus Christ. Dr. Peter Stoner, in his book “Science Speaks,” demonstrated the mathematical probabilities of one person in all human history, being able to fulfill just 8 of the Old Testament prophecies—concerning the Messiah. 1. Place of birth (Micah 5:2 Prophecy 321), fulfilled in Matthew 2:1-7, John 7:42, Luke 2:47. 2. Time of birth (Daniel 9:25 Prophecy 309, Genesis 49:10 Prophecy 17). 3. Manner of birth (Isaiah 7:14 Prophecy 164). 4. Betrayal by a close friend (Zechariah 13:6 Prophecy 356, Psalm 109 Prophecy 140). 5. The Manner of His death (Psalm 22:16 Prophecy 80). 6. The people who saw His death, their reactions—mocking, spitting, staring, etc. (Isaiah 53 Prophecy 236, Prophecy 242, Psalm 109 Prophecy 140, Prophecy 141, Psalm 22 Prophecy 74 Prophecy 75). 7. The Piercing of His side (Zechariah 12:10 Prophecy 354). 8. The manner of His Burial (Isaiah 53:9 Prophecy 255). The probability of one man fulfilling only eight of the possible 456 prophecies of the Old Testament was estimated by Dr. Stoner as: 1 in 10¹⁷. This is the same number that Cosmologist’s estimate as the total number of seconds in the age of the universe at 13.7 Billion years. The people were waiting for the coming of the Messiah in Jerusalem because they believed the prophecies that God spoke and understood that His arrival would take place at that particular time, according to Daniel’s prophecy. Matthew describes the arrival of Jesus at Jerusalem, in fulfillment of Daniel Chapter 9, Prophecy 309. These are the words of this 148th Prophecy, from Psalm 118. Psalms 118:22-26 The stone which the builders rejected Has become the chief cornerstone. This was the LORD’S doing; It is marvelous in our eyes. This is the day the LORD has made; We will rejoice and be glad in it. Save now, (Hosanna in Hebrew) I pray, O LORD; O LORD, I pray, send now prosperity. Blessed is he who comes in the name of the LORD! The words that the people proclaimed when Jesus came into Jerusalem were nearly identical to the words from Psalms 118:25-26. God determined that this scripture should be spoken, only when the Messiah arrived in Israel. Psalms 118, verse 22, describes the Messiah’s arrival at Jerusalem and His rejection by the leaders. Though Jesus is the Chief Cornerstone, the builders (leaders) in Israel, cast Him aside. When the people began to proclaim Jesus as their Messiah, the Pharisees rebuked them and complained to Jesus about their cries that He was their Messiah. Perhaps the “stones” Jesus was referring to, were those described by Deuteronomy 27:4 and Joshua 4:6-7. Jesus is the Cornerstone that all of the walls of life are connected to. He is the starting point of all future building. He is the foundation for all things in the past. Jesus is the place where the building of life rests and where all things in this life are joined together. He is the most costly Stone because of His Beauty and Strength. Jesus is the largest, most solid, and carefully constructed Stone of life. To cast Jesus aside is to cast aside the Chief Cornerstone, and never be able to complete the building of your life. The Preceding Is From the Book: “Prophecies of the Messiah,” for a complete list of 400 Messianic Prophecies that Jesus fulfilled. This image is in the public domain with no copyright or original authorship. Used by Permission from Lambert Dolphin and the Temple Mount Web Site. Ldolphin.org. 1 Kings 8:17-20 Now it was in the heart of my father David to build a temple for the name of the LORD God of Israel. 18 But the LORD said to my father David, “Whereas it was in your heart to build a temple for My name, you did well that it was in your heart. 19 Nevertheless you shall not build the temple, but your son who will come from your body, he shall build the temple for My name.’ 20 So the LORD has fulfilled His word which He spoke; and I have filled the position of my father David, and sit on the throne of Israel, as the LORD promised; and I have built a temple for the name of the LORD God of Israel. Dr. Alfred Edersheim, The Life and Times of Jesus the Messiah. Peter W. Stoner (November 2005). “Prophetic Accuracy”. Science Speaks. revised and HTML formatted by Don W. Stoner. ISBN 0-8024-7630-9. Retrieved 2007-02-09.